Five Rivers RC&D is hosting an electronics collection and recycling event this Saturday (April 27), from 9 a.m. to 1 p.m. at the Saline County Shop in Crete, 16th Street and Pine Ave.
Five Rivers and American Recycling, with a grant from the Nebraska Department of Environmental Quality, made this event possible to all households in and around Saline County for free recycling of computer systems, copy/fax/printers, and all types of electronics, batteries, and appliances. The City of Crete, Departments of Public Works currently has an opening for the position of Electric Department Groundsperson. This is a full-time, hourly position with the City of Crete. General functions include: Perform various tasks and material handling under supervision of Electric Line personnel. Minimum qualifications: must have high school diploma or GED; possess a valid driver’s license; must be proficient in written and spoken English; must be able to legally work in the U.S. Interested individuals may obtain more information or application materials at the links below or at City Hall - Human Resources between 8:00 a.m. and 5:00 p.m. weekdays or by phone at 826-4313 or email jobs@crete.ne.gov . Applications will be accepted until 5:00 p.m. Tuesday, April 30, 2019. The City of Crete is an equal opportunity employer. Click on the links below to view/download the job description and application materials. The City of Crete, Departments of Public Works currently has an opening for the position of Water Operator IV. This is a full-time, hourly position with the City of Crete. General functions include: Organize, and implement all aspects of maintaining City Water and Sewer Line Distribution systems. Report to Water Department Foreman, Water Department Superintendent, and Public Works Director. Minimum qualifications: must have high school diploma or GED; possess a valid driver’s license; must be at least 18 years of age; must be able to legally work in the U.S. Interested individuals may obtain more information or application materials at the links below or at City Hall - Human Resources between 8:00 a.m. and 5:00 p.m. weekdays or by phone at 826-4313 or email jobs@crete.ne.gov . The City of Crete, Parks and Recreation Department currently has an opening for the positions, Seasonal Park Employee. Maintain the City and Parks and Recreation (P&R) designated buildings, grounds, and equipment. Full-time hourly, seasonal position. This position will include mowing, weed eating, ball field preparation, swimming pool maintenance, and general upkeep of all city parks and buildings. Minimum age requirement: 17 years old. Desired Qualifications: Any combination of work experience and training that allows the duties and responsibilities of this position to be achieved. Preference will be given to job applicants documenting successful experience in like and similar positions and who currently hold a valid driver’s license. Interested individuals may obtain more information or application materials at the links below, at City Hall between 8:00 a.m. and 5:00 p.m. weekdays, by phone at 826-4313, or email jobs@crete.ne.gov . The City of Crete, Departments of Public Works currently has an opening for the seasonal position, Cemetery Assistant. General Description: Maintain the Departments of Public Works Parks Department designated buildings, grounds, and equipment. Report to Cemetery Sexton, and Public Works Director. Full-time, hourly position. Desired Qualifications: Any combination of work experience and training that allows the duties and responsibilities of this position to be achieved. Preference will be given to job applications documenting successful experience in like and similar positions, currently hold a valid driver’s license and who have a High School Diploma or equivalent. Interested individuals may obtain more information or application materials at the links below, at City Hall between 8:00 a.m. and 5:00 p.m. weekdays, by phone at 826-4313, or email jobs@crete.ne.gov . 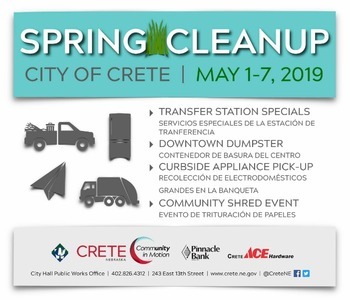 The City of Crete will hold the annual Spring Cleanup from Wednesday, May 1 to Tuesday, May 7, with special Transfer Station services, major appliance pick-up, downtown dumpster, and a community shred event. Transfer station regular hours are Tuesdays, from 1 - 6 p.m. and Saturdays from 9 a.m. - 5 p.m. The station is located 1/2 mile north of Highway 33 on Boswell Avenue on the east side of the road (478 County Road 2300). Curbside Pick-Up of Major Appliances: This service is offered by the City Public Works Department to those Crete residents who call ahead to arrange a pick-up before Thursday, May 2 at 5 p.m. Pick-ups will be made on May 1, 2, and 3. Call the Public Works office at 402-826-4312 to schedule. Appliances with freon must have it removed and tagged; no electronics. Pick-ups will not be made for calls made after the deadline. Downtown Dumpster: For the convenience of Crete residents, Crete Ace Hardware and the City will provide a dumpster at 1025 Main Ave. for large unwanted items to be dropped off. This location is not for TVs, tires, or construction material. Community Shred Event: Pinnacle Bank will host a community shred event on Saturday, May 4 from 9 - 11 a.m. when residents can bring old and unwanted documents to be shred for free. Please no three-ring binders; maximum of 10 boxes per person. Pinnacle Bank encourages residents to bring supplies and canned food for donation to the Blue Valley Community Action - Saline County Food Pantry. BVCA also suggests the following items: laundry soap, dish soap, toilet paper, deodorant, granola bars, and juice. For questions on these activities, contact the City of Crete Public Works Office at City Hall, 402.826.4312 or Pinnacle Bank in Crete for the community shred event. Historic flooding on the Big Blue River near Crete affected a number of areas on the west edge of town, including the Crete Community Garden, but with little damage sustained and by limiting certain practices the garden will be up and running for the season in May. Garden applications are available online or at City Hall. Gardeners can begin planting on May 1; no plots will be assigned after June 1. Resources from Nebraska Extension educators revealed a few concerns to gardening this season, namely a waiting period to harvest any produce for at least 90 days after flood waters recede. An article on food safety and flooded vegetable gardens says planting can still commence in an area that experienced this type of flooding, but the waiting period can reduce the risk of human pathogens present in produce. The 90-day wait will put harvest at the community garden on or about June 15, while any crops needing the 120-day wait should be harvested after July 15. Water over the garden receded by March 17. The garden is located south of the intersection of 10th Street and Thornwood Ave. and when river levels reached a record high on March 15, flood waters reached the garden, about 150 yards from the river bank, and kept it under about two feet of water for approximately two days. Once the river receded on March 17, the garden showed no silt or sand deposits or other physical damage. Some equipment in the garden shed will need reconditioning, but once the ground had a chance to dry, spring cleanup commenced on April 13 with the help of Doane University football players on their annual community service day. 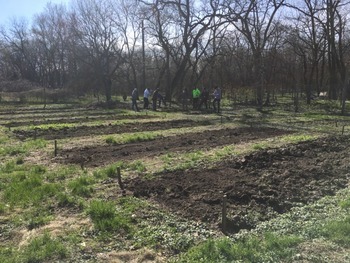 In addition to garden cleanup, volunteers also removed the wire fence and posts on the north, east and south sides of the garden in preparation for a new fence. A new fence and entrance gate on the west side of the garden was built by the Crete Rotary Club in the fall of 2017. Using extra grant funds, the club also purchased materials to help complete a new fence on the remaining three sides of the garden, a project organizers hope can be completed this spring. Registration is now open for Crete Recreation Swim Team until Friday, May 10. 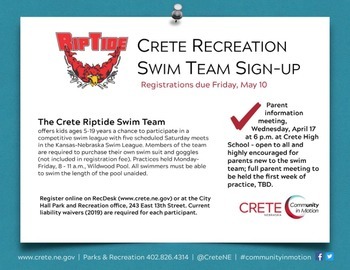 The Crete Riptide Swim Team offers kids ages 5-19 (if still in high school) a chance to participate in a competitive swim league with five scheduled Saturday meets in the Kansas-Nebraska Swim League. Members of the team are required to purchase their own swim suit and goggles (not included in registration fee). Practices held Monday-Friday, 8 - 11 a.m., Wildwood Pool. All swimmers must be able to swim the length of the pool unaided. A parent information meeting will be held on Wednesday, April 17 at 6 p.m. at Crete High School, open to all and highly encouraged for parents new to swim team; a full parent meeting to be held the first week of practice, TBD. Forms are available on RecDesk or at the Parks and Recreation office at City Hall. Participants must also have a liability waiver signed for 2019. 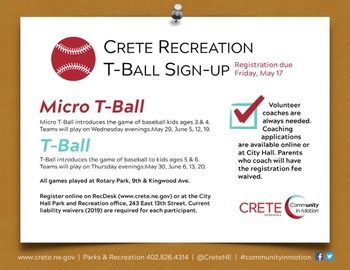 Registration is now open for Crete Recreation T-Ball and Micro T-Ball programs. Registrations for both are due on Friday, May 17. Micro T-Ball: Micro T-Ball introduces the game of baseball kids ages 3 & 4. Teams will play on Wednesday evenings: May 29, June 5, 12, 19. T-Ball: T-Ball introduces the game of baseball to kids ages 5 & 6. Teams will play on Thursday evenings: May 30, June 6, 13, 20. All games are played at Rotary Park, 9th and Kingwood Ave.
Forms are available on RecDesk or at the Parks and Recreation office at City Hall. Coaching applications are also available - parents who coach will have the registration fee waived. Participants must also have a liability waiver signed for 2019. The City of Crete was awarded a $125,000 matching grant towards renovations for the city-owned Isis Theatre in an announcement made Monday (April 1) by the Nebraska Department of Economic Development. The Blue River Arts Council, a 501(c)(3) nonprofit formed in the fall of 2018, will operate the theatre as a community arts venue through an agreement with the city and has agreed to repay the city for the purchase price of the building and contents as well as a portion of the matching funds. Civic and Community Center Financing Fund grants can be applied to construction or improvement of gathering spaces, recreation, convention and cultural centers that are municipally owned at the time of application. 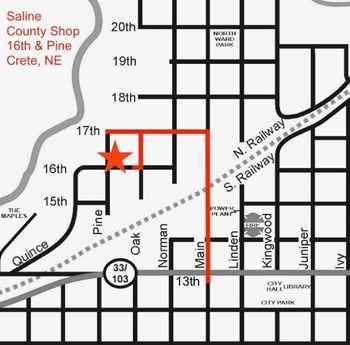 The City Council approved purchase of the building in December 2018 and the city will match the provided grant funds, bringing the total to $250,000 available for upcoming renovations. The city purchased the theatre at its county-assessed value using funds previously held from the sale of the former armory on East 1st Street, which stipulated the funds be used only for future CCCFF related projects. BRAC will make ten annual payments to the city and at the end of that term, the building and all contents will become property of the BRAC. An exploratory committee was formed in July 2018 to discuss the theatre’s future when then owner Thom Reeves announced his decision to close the business, which had been in operation on West 13th Street since 1926 and had completed a successful conversion to digital projection in 2012. The committee later formed BRAC to pursue ownership and operations of the theatre and expand its use; they requested the city’s involvement as an alternative to closing and sought city ownership of the building to qualify for the economic development funds. Motivations of Mayor Roger Foster and City Council members when pursing this project last year still hold true. They looked at other communities and nonprofits in the state dedicated to preserving their struggling theatres rather than lose a center of local entertainment, which coupled with Crete’s ongoing downtown revitalization efforts. As stewards of public funds, Foster and the council always evaluate the use of those funds, making sure they act in a responsible and efficient manner for the benefit of the citizens. April 2019: CCCFF grant application approved.